Our champagnes are matured in oak or acacia vats for at least 8 months to give them a subtle, woody aroma. Each one of our blends is singular and will accompany your magic moments. Our most exclusive blending, limited to only 166 numbered bottles. This Brut Nature cuvée of 166 bottles was born in 2012 an exceptional year for champagne. Matured in oak vats, this Champagne reflects all our know-how in the demanding development of wines respectful of tradition and nature for more than 40 years. Its woodsy cladding evokes the vine stock from which come the clusters of this vintage and its vinification in our barrels. Its traditional stringing - hemp twine and wax seal - makes use of Champagne know-how dating back to the 18th century. The opening of such a bottle is a ceremony: cut the string with scissors and carefully remove the cap to taste this exceptional wine! Each one of these 166 bottles are numbered, presented in a case and accompanied with silkscreen printed flutes. It makes the perfect gift for exclusive champagne amateurs. Vintage year 2012 with fresh almond and slight mint aromas at first scent. Classy and elegant, it is perfect for a refined aperitif. Passion, conviction and enthusiasm have guided Thierry throughout his professional life. Resulting in the 2006 vintage, this Thierry Ruffin vintage is a tribute to the values that characterized him and that he held to heart. Grand Reserve 2006 with a nose subtly buttered like brioche. Generous mouth with a creamy and racy finish. Beautiful champagne to serve at table, serve a slightly cool to allow its appetizing flavors and elegant softness develop. For such an exceptional champagne, we wanted an exceptional presentation, so it comes with an original and refined packaging. 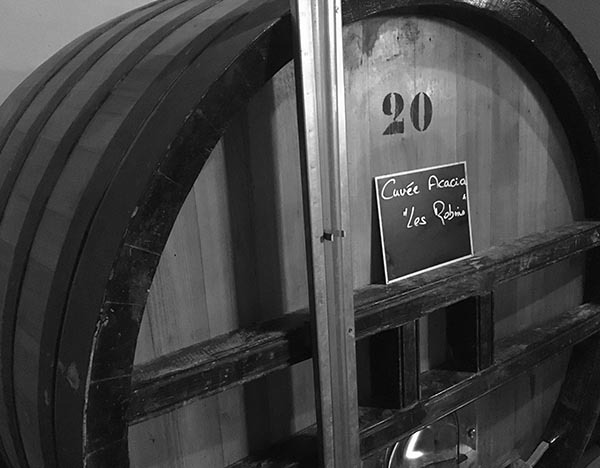 Matured in acacia vats with a typicity (20% Pinot Noir, 80% Chardonnay). Atypical because of its goffered smoothness both winey and fruity, this fresh champagne with fine and delicate bubbles will perfectly accompany your aperitifs. Subtle mint smell, soured mouth, salty finish. Refined in oak vats following the Solera method with 40% reserve wine. Typicity (50% pinot noir, 50% chardonnay) this champagne allies strength with elegance. With its subtle equilibrium, it is a perfect wine for aperitif as well as to accompany an entire dinner. Scent of brioche, white-flesh fruits aromas, buttered and mineral overtones, fresh finish. Refined in oak vats with 50% Pinot Noir and 50% Chardonnay. This demi-sec champagne is a real, sweet treat especially when enjoyed with pastries. It can also delight you served with foie gras or Asian food. Frank smell, soft mouth with a pear overtone, sustained finish. Adding to the fineness of our cuvée, the painters Nicole Bottet, Nieves Salzmann and Gottfried Salzmann have created elegantly enhanced golden labels. 50 years ago, Yves Ruffin chose to convert his three hectares situated between Avenay Val d’Or and Tauxières to organic farming. He did so going against the trends of the time, when winegrowers and technicians didn’t take into consider the impact of their agricultural practices on the environment. The future would nevertheless rule in favour of such few pioneers who chose to be different and to stand their ground despite the critics. His son, Thierry, carried on his tradition and contributed to developing alternative cultivation methods. 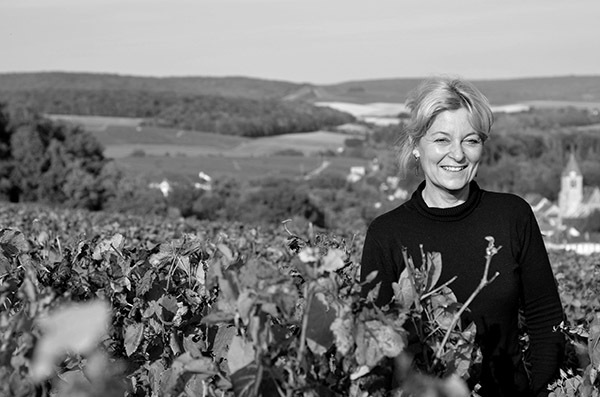 In 2008, his wife, Sylvie, succeeded him and still today continues production with this demanding approach. Organic farming consists in managing the equilibrium between the ground, the plants, and climate, as opposed to traditional farming, which claims to domesticate the ground and the plants because it cannot control climate. Fertilization is made only with compost. The soil is worked delicately in our northern lands and narrow vineyards (with only a 1.10 m gap). These are naturally covered with grass from late July to mid-April, and afterwards it is mechanically exploited. Organic vine-growing is demanding and needs many workers; for the soil working, but also the managing of the plant (disbudding, trellising and trimming), which needs a lot of care. Without chemical products, foliage and grapes have to be correctly ventilated and orientated. Indeed, rapidity and quality of intervention are essential. The harvest usually takes place in mid-September and picking is done by hand. All our vintages are matured in oak and acacia vats to perpetuate the tradition of the great wines of Champagne. 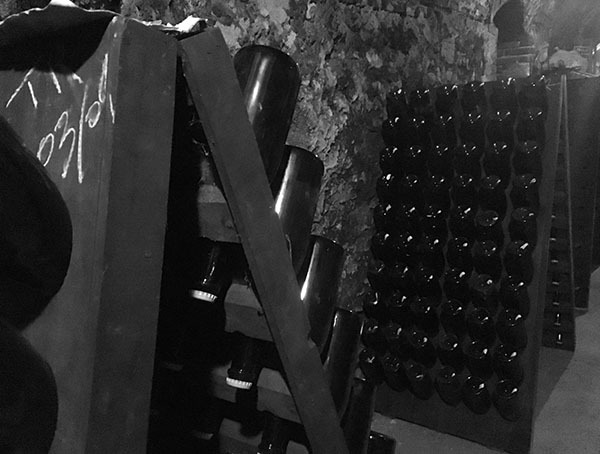 Once bottled, our champagnes will, after bubbles have appeared, slowly and serenely evolve in the protective obscurity of our cellars. We only sell them when we are sure that they have reached their optimal maturity. Our vineyard of three hectares is situated to the north of Epernay in the Marne Valley, which is the cradle of Champagne, famous for its Pinot Noir. 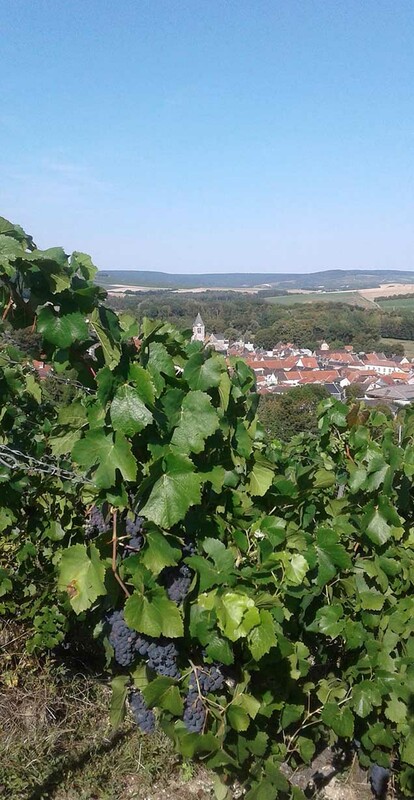 It grows in the heart of the hillsides of Champagne, a UNESCO World Heritage Site since 2015, in the villages of Avenay Val d’Or and Tauxières, both ranked “Premier Cru”. This appellation distinguishes terroirs whose favourable, natural conditions yield wines of exceptional quality. Among the 300 wine-making villages of Champagne, only 44 have received this certification label. If the grapes’ quality is the basis of the wine-grower’s work, he nevertheless needs to create the best vintage blending to unveil the potential of each cuvée. Our vineyard is fully involved in organic farming since 1971. To find out our list of importers, please contact us. If you wish to receive the price listing of our vintages, please don’t hesitate to ask, and we’ll do our best to reply as soon as possible.